Renewing memories of our wonderful TIAMSA reception at CAA 2017, Christie’s Education once again hosted a Valentine’s day early evening reception for us at Rockefeller Center. Thanks to our host and TIAMSA member Véronique Chagnon-Burke (Director, Christie’s Education NY) and her great team, we enjoyed networking and meeting new members in a highly convivial atmosphere in the beautiful spaces of Christie’s Education with a spectacular view of Rockefeller Center! Full abstracts may be found here. 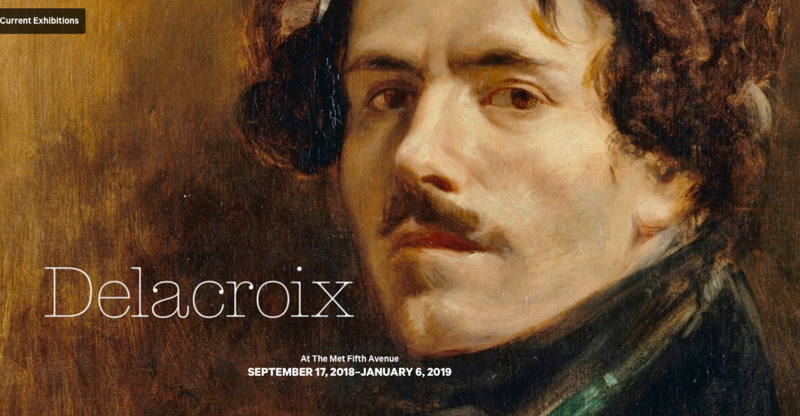 TIAMSA member Asher Miller (Associate Curator, European Paintings) offered a tour of Delacroix, the first comprehensive retrospective devoted to the French painter ever held in North America. A joint project with the Musée du Louvre, the exhibition features more than 150 paintings, drawings, prints, and manuscripts—many never before seen in the United States. The tour paid special attention to matters pertaining to the art market. Véronique Chagnon-Burke (Academic Director, Christie’s Education New York) and Joey Quigley (Associate Vice President, Account Manager, Estates, Appraisals & Valuations, Christie’s) offered a preview and walkthrough of property from The Collection of Harry W. and Mary Margaret Anderson. The Collection, offered for sale at Christie’s, featured works by artists including David Hockney, Roy Lichtenstein, Alexander Calder, and David Smith. The Ebsworth Collection—”the greatest privately owned collection of American Modernist art ever to come to market”—was also on view. 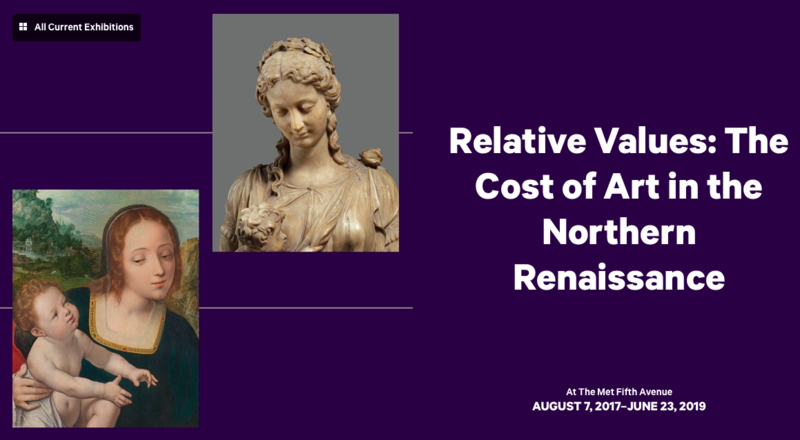 TIAMSA New York hosted a tour of Relative Values: The Cost of Art in the Northern Renaissance with Elizabeth Cleland (Associate Curator, European Sculpture and Decorative Arts). Bringing together 62 masterpieces of northern European art, the exhibition revolves around questions of historical worth, exploring relative value systems in the Renaissance era. The objects on view—tapestry, stained and vessel glass, sculpture, paintings, precious metal-work, and enamels—are juxtaposed with pricing data from sixteenth-century documents. 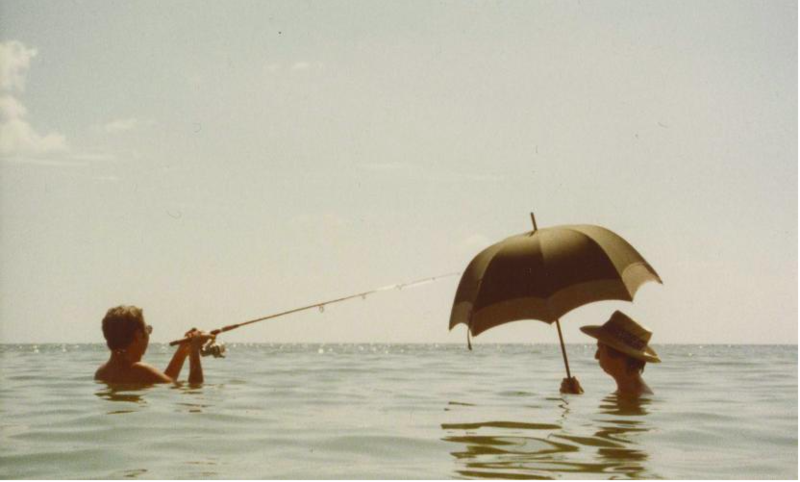 Vienna, 27-29 Sept 2018 – TIAMSA’s Second Annual Conference, “Art for the People?” hosted by the Belvedere, the Dorotheum and Vienna University’s Department of Art History. Our second annual conference was held in Vienna. With its extraordinary cultural institutions and a thriving local art market, the city provided a great venue for this event hosted by three distinguished institutions. 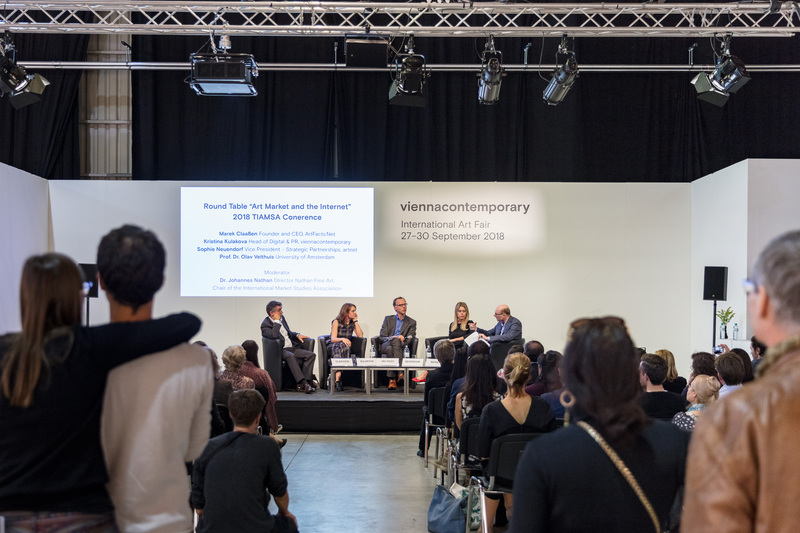 The conference began with two special tours – one of Vienna Contemporary, Austria’s International Art Fair, the other of the Belvedere Research Center – followed by a round table discussion organized in cooperation with viennacontemporary (see below). Day two found us convening at Belvedere21, the museum’s beautiful venue for contemporary art, and concluded with a fascinating keynote lecture by Payal Arora (University of Rotterdam) entitled “Automating Culture. How Digital Platforms are Shaping the Art World”. The last day was held at the magnificent Palais Dorotheum, the world’s oldest auction house (est. 1707) located in Vienna’s historic centre. The conference was complemented by the launch of TIAMSA legal and our Annual General Meeting on 29 September. 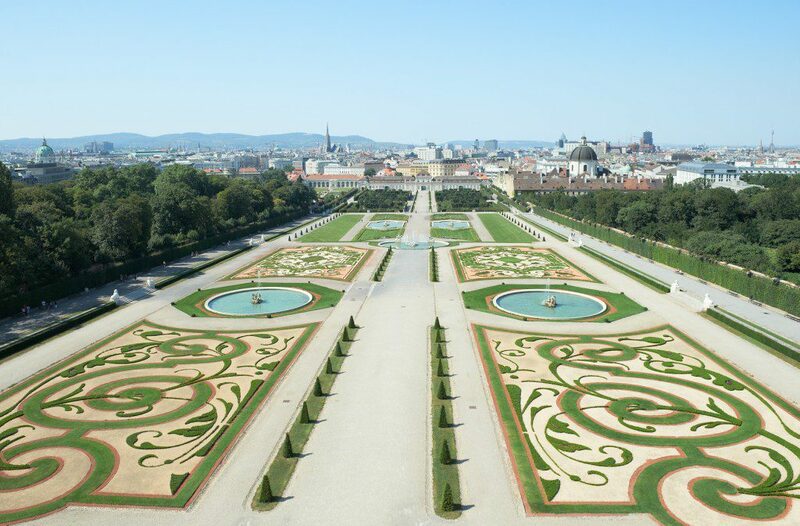 The Belvedere in Vienna – one of our hosting institutions © Belvedere, Wien. 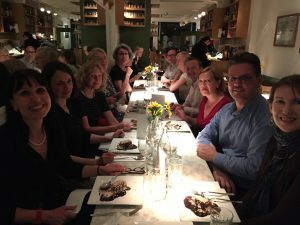 Our AGM provided a review of TIAMSA’s activities in 2017/2018, an overview of TIAMSA’s finances and figures (we have just become a 250-member association) a preview of our conference in 2019, and a lively discussion on our association’s future. It also elected Veronika Korbei as TIAMSA’s new Co-Chair and Nirmalie Mulloli as TIAMSA’s new Coordinator: Congratulations! TIAMSA-NY organized an exciting walk through the Robert Rauschenberg Foundation at 381 Lafayette St. (between Great Jones St. and E. 4th St.) with a visit to the foundation’s gallery, Rauschenberg’s former studio and living areas, and portions of the foundation offices. 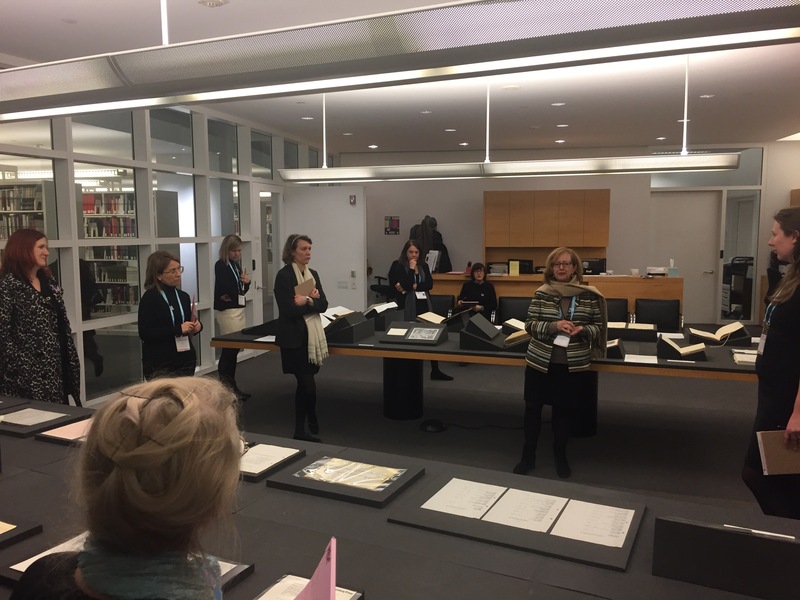 We cordially thank Francine Snyder, Director of Archives and Scholarship, and Julia Blaut, Curator and Director of Curatorial Affairs who led the tour together. Topics discussed included the activities of the foundation and its exhibition and archives programs. 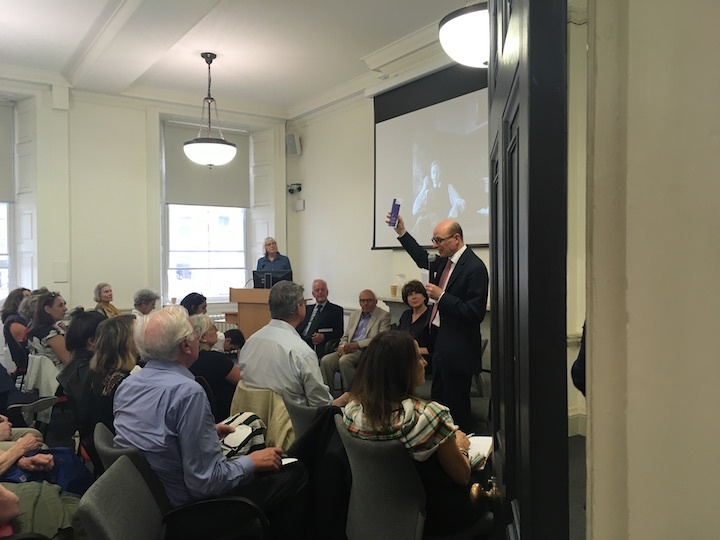 The London Group of TIAMSA – The International Art Market Studies Association and The Courtauld Alumni Association organized an evening remembering some refugee art dealers in London during and after WWII. 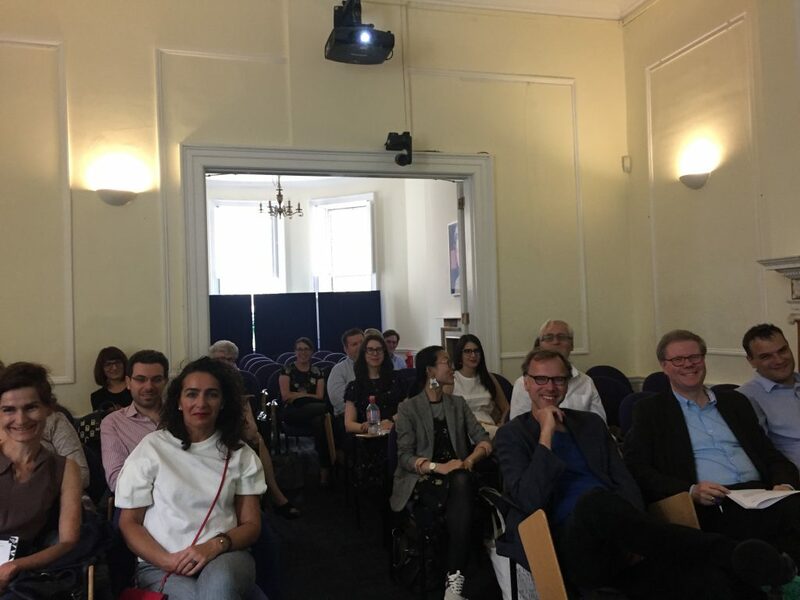 Attended by more than seventy individuals, some of whom had come from abroad for the evening, the event began with words of welcome by Prof. Antony Eastmond (Dean and Deputy Director of the Courtauld Institute) and Barbara Pezzini (TIAMSA London and Editor in Chief of Visual Resources). 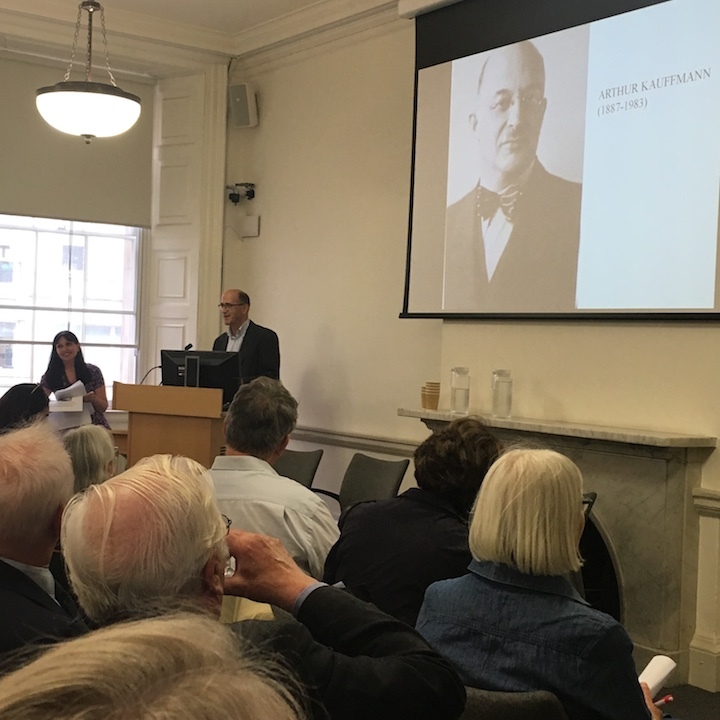 This was followed by a fascinating lecture by Professor Michael Kauffmann (Director Emeritus of the Courtauld Institute of Art) on his father Arthur Kauffmann and some contemporary refugee art dealers. The evening concluded with a round table involving additional descendants of refugee art dealers: Marion Davies (daughter of Herbert Bier, whose archive is now at the Wallace Collection), Elizabeth Drey Brown (granddaughter of Francis Drey) and Patrick Matthiesen (Director of the Matthiesen Gallery and son of Francis Matthiesen), moderated by TIAMSA Chair Johannes Nathan (Editor in Chief of the Art Market Dictionary). Have a look at some impressions below and click here to see the full programme. In this talk, Johannes Nathan further discussed a proposal which he briefly presented at the recent ‘Spoliation Conference’ (National Gallery London, 12 September 2017). This talk (in German) formed part of the ‘Mittagsgespräche‘ related to matters concerning provenance research and displaced or looted art (Thursday, 28. June 2018, 12:15, Ahnensaal des Bundesdenkmalamts, Hofburg, Säulenstiege, Vienna I). TIAMSA New York visited the Alberto Savinio exhibition at the Center for Italian Modern Art, with an introduction by Heather Ewing, CIMA’s Executive Director. Alberto Savinio, Senza titolo (Untitled), 1929. Private Collection, Milan. © 2017 Artists Rights Society (ARS) SIAE, Rome. Photo: Dario Lasagni. Das „Art Market Dictionary (AMD)“ ist das erste Nachschlagewerk zum internationalen Kunsthandel im 20. und 21. Jahrhundert. Es entsteht derzeit unter Mitwirkung von fünfzehn “Section Editors”, mehr als dreihundert AutorInnen und einem renommierten internationalen Fachbeirat im de Gruyter Verlag, Berlin. Partnerinstitutionen sind u.a. das Getty Research Institute, das Zentralinstitut für Kunstgeschichte, das Forum Kunst und Markt an der TU Berlin und das Belvedere Research Center. Eine Vernetzung mit dem Lexikon der Österreichischen Provenienzforschung (LÖPF) ist vorgesehen. Das AMD wird ab 2019 erscheinen. – Im Zuge der Bearbeitung der Einträge zu Österreich erörterte dieses gut besuchte Seminar die Besonderheiten des österreichischen Kunstmarkts und die Herausforderungen bei dessen Erforschung. Es diente auch der Vernetzung von ExpertInnen. Im Rahmen des 10. Vernetzungstreffens von DArtHist zum Thema ‘Art Market & Exhibitions’ wurden zwei aktuelle Projekte vorgestellt: Johannes Nathan, Christian Huemer und Veronika Korbei ermöglichten einen Einblick in die Arbeit am ‘Art Market Dictionary’; im Anschluss stellte Christina Bartosch das neue Projekt ‘Exhibitions of Modern Painting 1905-15’, welches am Wiener Institut für Kunstgeschichte angesiedelt ist, vor. Moderiert wurde das Treffen von Christian Huemer (vgl. http://www.darthist.at/newsreader/id-10-vernetzungstreffen.html). From production to access, the world of visual arts has changed substantially in the last decades, especially considering the performances of agents and institutions which shape the legitimating structures and the definitions of what art is – or is not. However, the logic of production, circulation, legitimization and consumption is also associated with spheres other than those specific to the art world, highlighting the connections inherent in the development of the greater art system. In this sense ART BEYOND ART, the first Symposium on Art Systemic Relations, debated the transformations in the mode(s) of operation and in the production of contemporary visual art. Essentially transdisciplinary, the event opened the dialogue between researchers of Arts, Sociology, Anthropology, Philosophy, Literature, Technology, Sciences and other areas. – This conference is an initiative of TIAMSA Art Market and Collecting – Portugal, Spain and Brazil (TIAMSA AMC_PSB). All further information can be found in the related TIAMSA post and on the Conference Website. 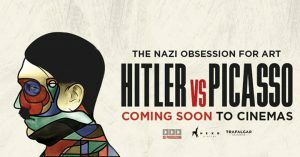 Narrated by Toni Servillo (star of the Oscar winning film The Great Beauty), Hitler vs Picasso and the Others is an incredible journey through five exhibitions, displaying masterpieces by Botticelli, Klee, Matisse, Monet, Chagall, Renoir, and Gauguin. 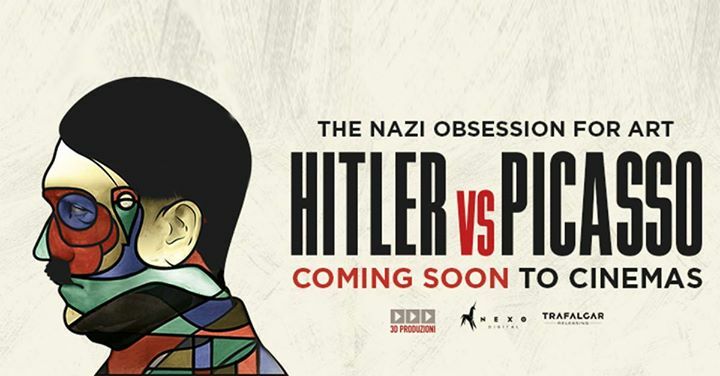 Linked to each exhibition are moving stories of those who witnessed the systematic destruction and looting of the day – from the Bernheimer family, who were forced to barter their freedom, to ‘Hitler’s dealer’, Hildebrand Gurlitt, known to have hidden away many extraordinary art treasures (90 minutes). Hosted by board members Lynn Catterson and Johannes Nathan, our ‘business meeting’ during the CAA conference was a friendly gathering to share and discuss with our members and friends the plans for the year and to listen to ideas and concerns. There was a lively response from those attending, all of them happy to share this opportunity for networking and thinking about activities of TIAMSA Groups. On the occasion of the CAA Conference in Los Angeles, TIAMSA was offering a two hours program with Gail Feigenbaum (Associate Director of the Getty Research Institute – GRI), Sally McKay (Head of Special Collections Services at the GRI), and Sandra van Ginhoven (Research Associate at the GRI) who warmly welcomed our members for a special tour of the Getty’s holdings of dealers’ archives and for an introduction to the Getty Provenance Index and the Project for the Study of Collecting and Provenance at the Getty Research Center. 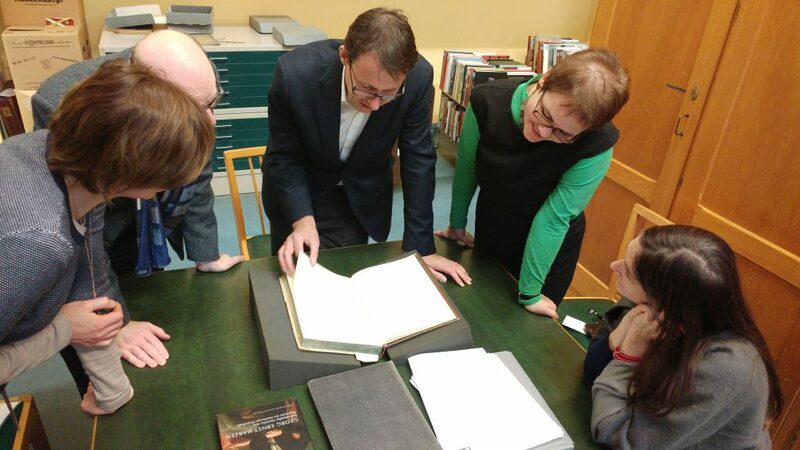 We were first invited to study a wonderful display of documents from the Getty archive, including items such as a 17th century Italian Inventory, an early 20th-century stock book from the Knoedler archive, and documents from the archive of Willi Bongard, creator of the legendary “Kunstkompass” – all of them expertly explained by Gail Feigenbaum, Sally McKay and Sandra van Ginhoven. This was followed by a series of short presentations on the history and the current transformation of the Getty Provenance Index, held by Anna Cera Sones, Eric Hormell, Claudia Einecke, Kelsey Garrison, Kelly Davis and Sandra van Ginhoven. We were all deeply grateful for this extremely generous welcome, paired with warm encouragements to study the ever growing holdings of the Getty archive and to apply for Library Grants. At 7pm our group was invited to join the CAA VIP reception in the Getty Museum Lobby and to study the fantastic exhibition on Harald Szeemann at the GRI. Gail Feigenbaum, Deputy Director of the Getty Research Institute, addressing TIAMSA Members studying the special display of archival material arranged for our visit. TIAMSA joined the College Art Association (CAA, collegeart.org) in 2017 as an affiliated society, entitling us to a session at the CAA conference. Our members Véronique Chagnon-Burke and Julie Reiss (both Christie’s Education, New York) convened a wonderful session entitled ‘Changing Hands: When Art History Meets the Art Market’. Three fascinating case studies by Karen Meyer-Roux, Getty Research Institute (‘Unraveling the Path of a Tapestry in the Records of French & Company’), Sydney Stutterheim, The Graduate Center, CUNY (‘Artistic Ownership: Martin Kippenberg’s Authorial and Market Manipulations’) and Orianna Cacchione, Smart Museum of Art at the University of Chicago and Sara Moy, Independent Conservator (‘Apples, Bananas and Meat: Re-Creating Gu Dexin’s Artworks in his Absence’) provided a most welcome opportunity to explore the forces exerted by the market on the making of works of art – and on their subsequent fate. 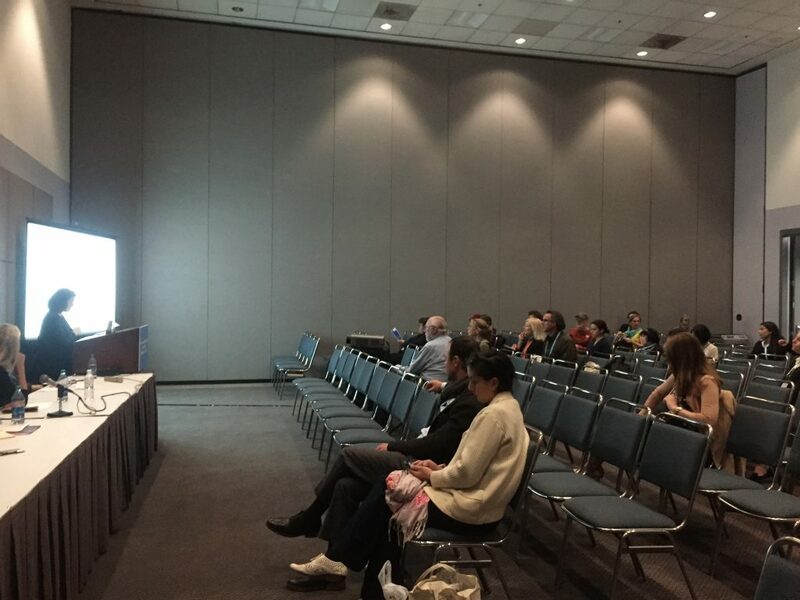 Julie Reiss, Session Chair, addressing the audience during the TIAMSA Session at CAA 2018 in Los Angeles. Christie’s Los Angeles generously welcomed TIAMSA members for an exciting lecture on “Street Art in Los Angeles: Controversy and Ethical Slippages” by Lizy Dastin (Christie’s Education alumna), followed by a reception. TIAMSA Berlin hosted a conversation with Susanne Kessler, a widely exhibited painter and installation artist, exploring her experiences and views of today’s art trade and what it means to be an artist in an art world so strongly shaped by market forces. In the nineteenth century the circulation of works of art developed into its recognisably modern form. The forces of increasingly globalized capitalism, imperial routes and new means of transport, coupled with the growing reach of advertising and the press caused an unprecedented movement of artists, goods and materials. 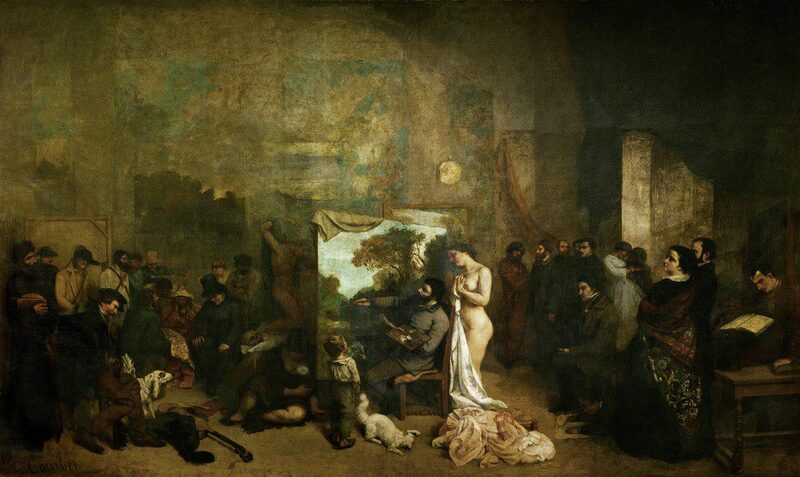 Larger audiences for art in newly founded museums and galleries across the world also contributed to, and benefitted from, this increased mobility of art. ‘Art on the Move’ , a two-day conference co-sponsered by TIAMSA at the Ikon Gallery and the Barber Institute, examined and problematized this emerging field of study. It coincided with an exhibition dedicated to the works of Birmingham born engraver, miniature portraitist and photographer Thomas Bock (c.1793–1855) at the Ikon Gallery, Birmingham. The newly founded TIAMSA ‘Translocations’ chaired by Diana Kostyrko (Australian National University, Canberra) and David Challis (University of Melbourne) held a session at this year’s AAANZ (Art Association of Australia and New Zealand) Annual Conference in Perth. 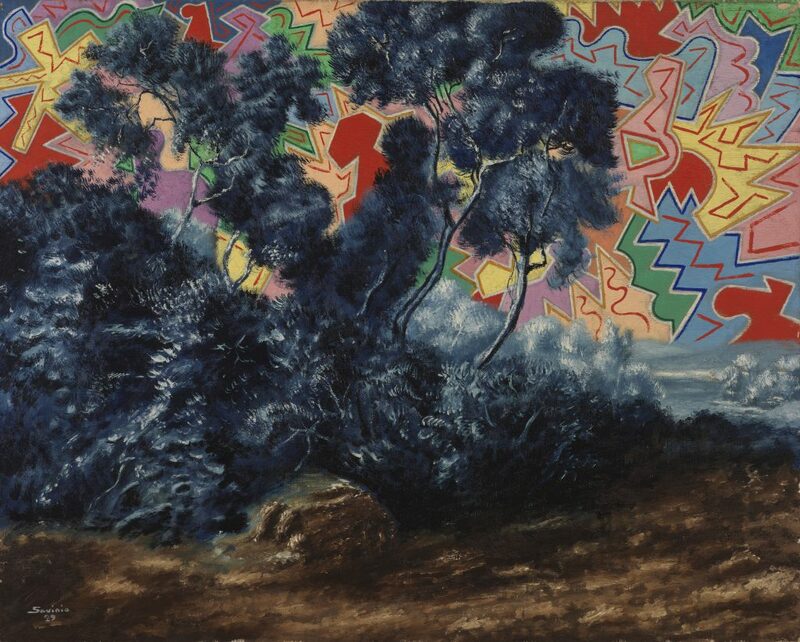 ‘CHANGING PLACES, ALTERING SPACES: THE TRANSLOCATION OF MODERN ART FROM 1918 TO 1939’ explored selected aspects of art travelling outwards from its natural and spiritual ‘heart’ and the forces – engineered, spontaneous or predictable – which spurred that movement. Speakers included David Challis, Victoria Souliman (University of Sydney/Université Paris Diderot), and Michael Moignard (La Trobe University). 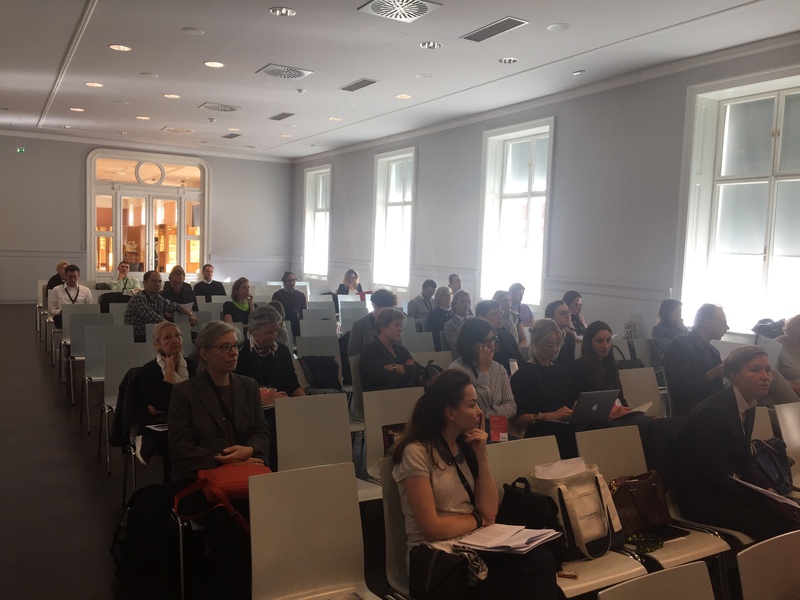 The Dipartimento di storia dell’arte e spettacolo of the Sapienza University hosted a two-day conference on the art market. Convened by Paolo Serafini, newly appointed professor for art market studies at the Sapienza University, it presented papers by Kim Oosterlinck, Filip Vermeylen and Christian Huemer, all of whom are researching the development of the art market in its historic, artistic, economical and social contexts. The three speakers (all TIAMSA board members) are also part of the research team ‘The Art Market of America’ funded by the Getty Research Institute, Los Angeles. The conference also inaugurated TIAMSA Italy. 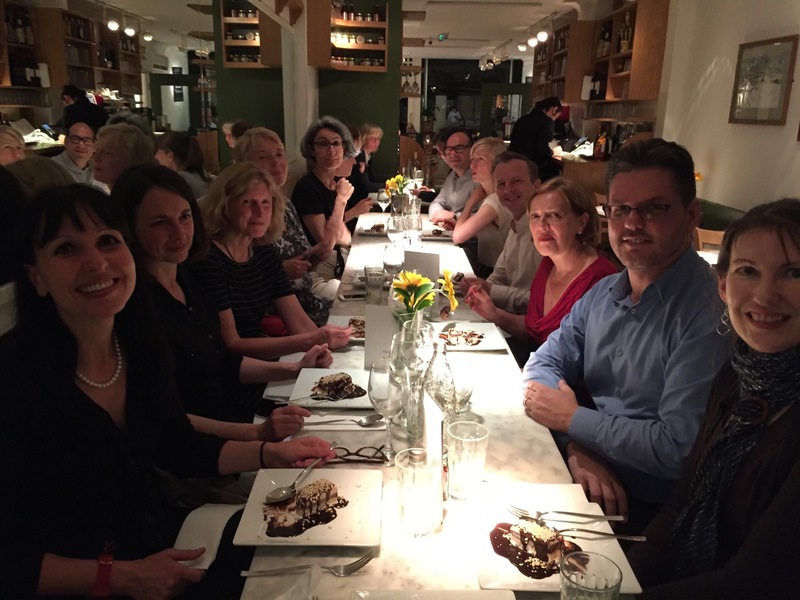 Another event of TIAMSA Berlin took members to two exhibitions in Hamburg. 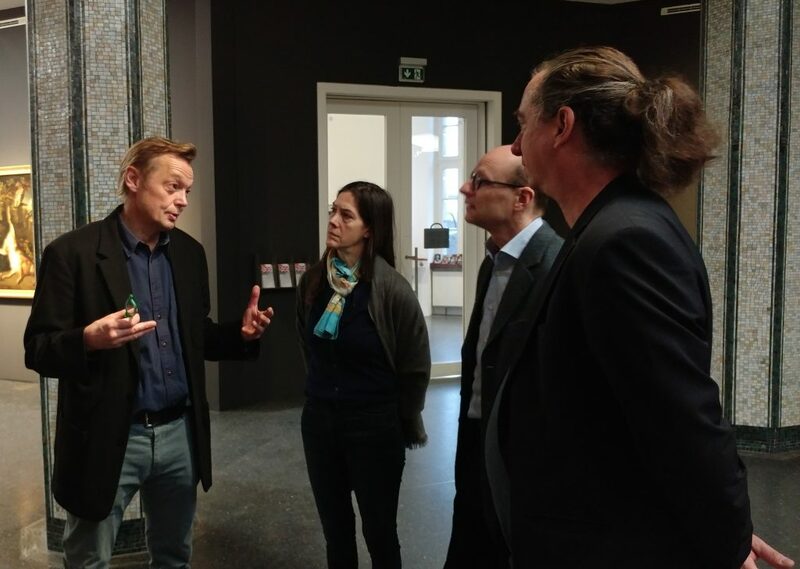 Dr. Wilhelm Kaiser, Director of the Bucerius Kunstforum, generously gave a private tour through ‘The Birth of the Art Market’ exhibition which he had also curated. Featuring outstanding Dutch and Flemish paintings of the 17th century, mostly from German and Netherlandish collections, the show illustrates how particular groups of buyers were attracted by different genres, how artists produced their work for different more or less wealthy collectors, and how the art market thus helped to define of taste and expertise at the time (until 7 January 2018) – In the afternoon, Dr. David Klemm, Curator of Italian Drawings at the Hamburger Kunsthalle, provided fascinating insights into the dealings of Georg Ernst Harzen, the dealer and collector responsible for the extraordinary stock of prints and drawings (including drawings by Leonardo and Raphael) that he eventually donated to the Kunsthalle – a gift which then prompted the foundation of the museum. The last part of our visit was dedicated to the exhibition of Claude Lorrain’s drawings, ‘Das Licht der Campagna’, the first of its kind in several decades, presenting dozens of drawings by the artist generously lent by the British Museum. Apart from providing many wonderful impressions of Claude’s extraordinary vision of landscape, the show also illustrates how the artist drew a strict separation between his painterly output – produced for the market of his time where they were in high demand – and his drawings, which were not for sale despite repeated requests from collectors (until 14 January 2018). New York, 1 Nov 2017, 6pm – Tour of the Renee & Chaim Gross Foundation & Visit to the Grey Art Gallery exhibition, Partners in Design: Alfred H. Barr Jr. and Philip Johnson. TIAMSA New York’s first event this fall took place at the Renee & Chaim Gross Foundation (526 LaGuardia Place) at 6 p.m. with a private guided tour. First established in 1974 with donations from friends and supporters of American artist Chaim Gross (1904-91), including Joseph H. Hirshhorn and Roy R. Neuberger, the Renee & Chaim Gross Foundation was incorporated as a 501(c)(3) not-for-profit organization in 1988. The Foundation is located in the couple’s historic Greenwich Village townhouse and the artist’s studio space. This was followed by a visit of the nearby Grey Art Gallery at NYU (100 Washington Square East). Its show, Partners in Design: Alfred H. Barr Jr. and Philip Johnson, explores how Alfred Barr, MoMA’s first director, and Philip Johnson, the curator of architecture, introduced modern design to North America. 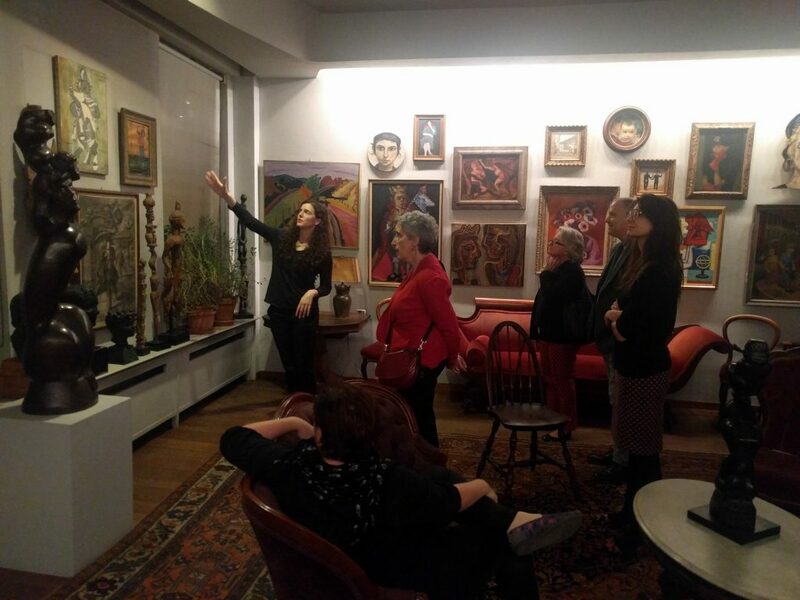 Sasha Davis, Executive Director of the Renee & Chaim Gross Foundation, gives New York TIAMSA members a tour of the Gross’s Greenwich Village townhouse, featuring works by artists including Louise Nevelson (Chaim Gross’s student), Milton Avery, and Stuart Davis. 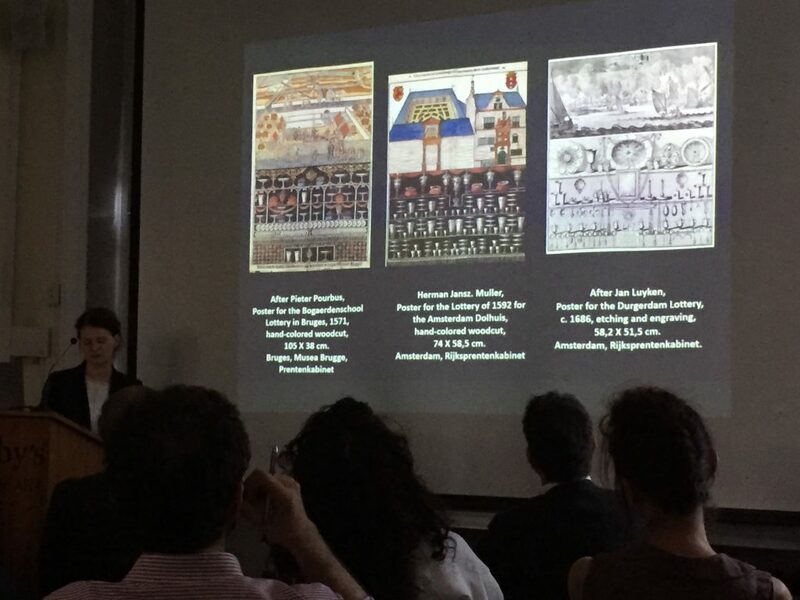 TIAMSA supported a fascinating two-day workshop at one of our institutional members, the Centre allemand d’histoire de l’art (German Research Center for Art History) in Paris. Organized by Julia Drost, Fabrice Flahutez, Anne Foucault, and Martin Schieder, this workshop explored the international market for Surrealist Art in the post-war era. Hosted in collaboration with LABEX H2H, the event is part of a larger research programme which began in 2014, investigating Surrealism in the context of art galleries, collectors and middle-men (Le surréalisme au regard des galeries, des collectionneurs et des médiateurs). Follow this link for more information. TIAMSA is proud to have made this its first official appearance in Paris! 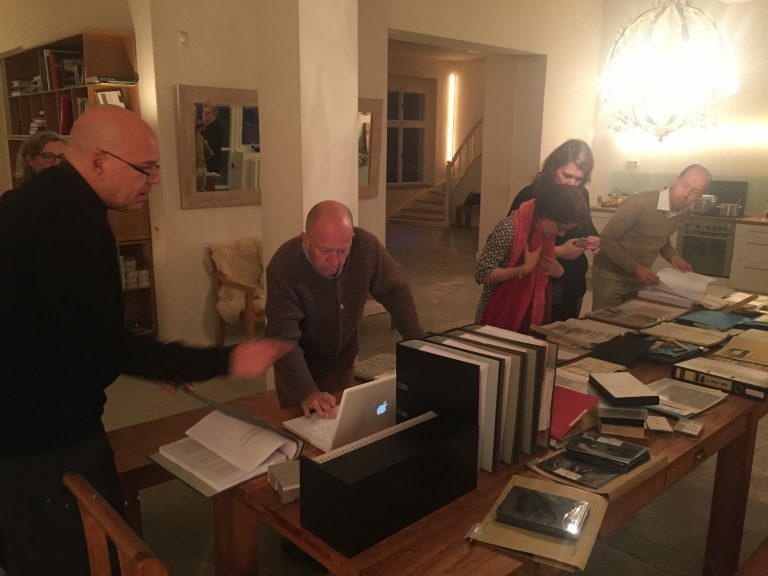 TIAMSA Berlin had a fascinating tour of the archive of Judy (Gerd Harry) Lybke who founded his legendary gallery Eigen + Art in Leipzig in 1983. We looked at the rich and largely complete files that document the gallery’s activities and exhibitions from the very start, enjoyed snippets from the extraordinary video archive and even peeked at Judy’s “StaSi” File. All was expertly made accessible and explained by Judy’s archivist Frank Eckart – and of course by Judy himself who vividly conveyed the challenges and rewards of running an independent art gallery in the German Democratic Republic and also reminisced about the activities that followed 1989, with forays to Tokyo, London, New York… In conclusion Judy most generously invited us to stay for a delicious dish of spaghetti and a glass of red wine: We left only late, and with heartfelt thanks! After a fantastic response to our call for papers, TIAMSA’s first international conference on Art Fairs united 28 speakers from countries worldwide who explored this year’s theme – “Art Fairs” – in six sessions. Held at Sotheby’s Institute of Art in London, the conference featured keynotes by Sophie Raux (Université Lumière – Lyon 2) and Noah Horowitz (Director Americas / Member of the Executive Committee, Art Basel) who responded to questions from Olav Velthuis and the audience. 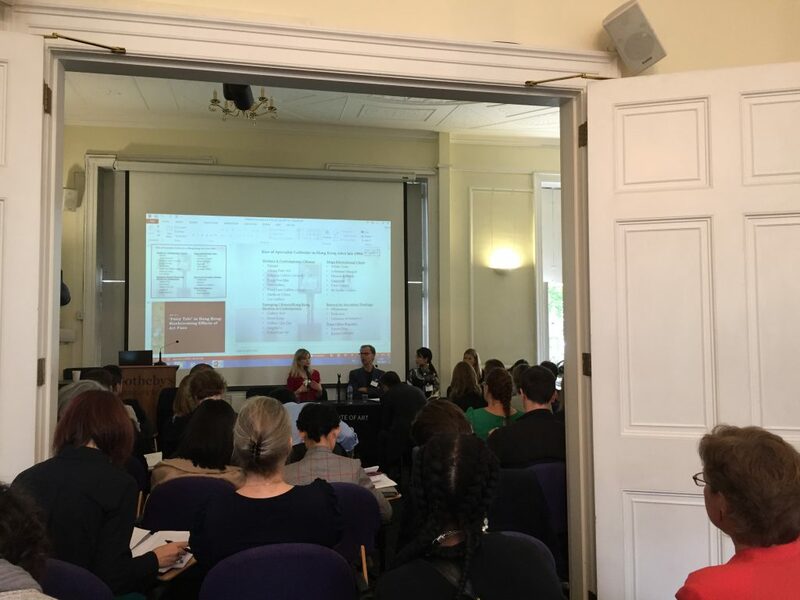 Carried by many excellent papers, the event was marked by enthusiasm, lively debate and intensive networking! A conference review by Helene Bosecker has recently been published by arthist.net. Stay tuned for our next conference, to be held in summer 2018 in Vienna. 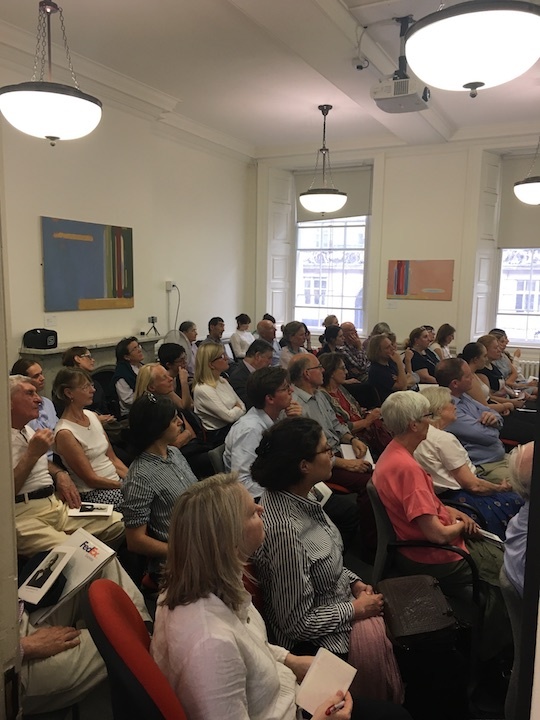 We were happy that many of our members attended our second Annual General Meeting, held just before our conference at Sotheby’s Institute of Art, London. We looked back on our first year, fine-tuned our ‘modus operandi’, and elected and cordially welcomed four new board members, namely: Kim Oosterlinck (Liaison Officer, Economics), Iain Robertson (Journal Officer), Olav Velthuis (President) and Filip Vermeylen (TIAMSA Groups Officer). We also engaged in a fruitful discussion of plans for the next year, a conversation that continued on Saturday 15 July at 4:45pm when all conference attendants participated in a collaborative brainstorming on the future of our association and on next year’s conference. 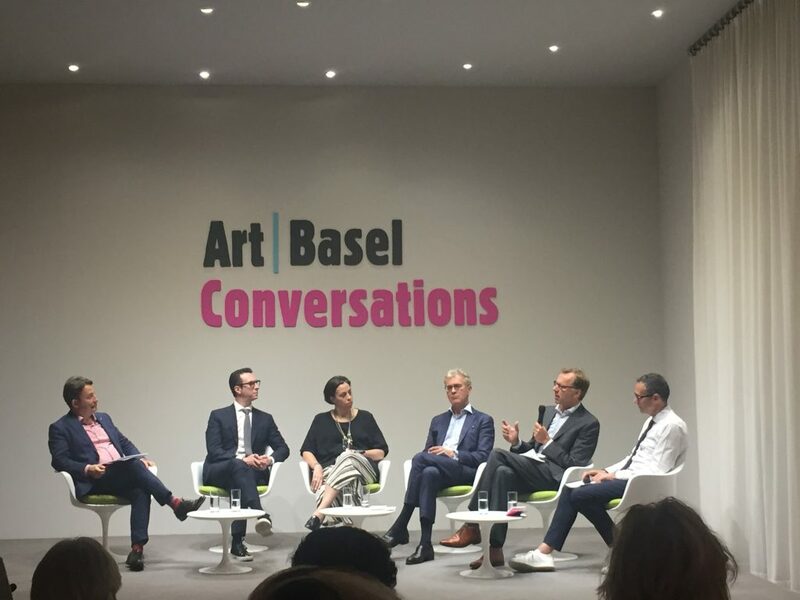 Art Basel and TIAMSA teamed up for a round table (‘Conversation‘) entitled ‘New Rules: Is the Artworld a Mature Industry?’ TIAMSA was be represented by Olav Velthuis, TIAMSA president, who discussed the subject with Lindsay Pollock, Bob Rennie, Adam Sheffer and Pierre Valentin; the conversation was moderated by András Szántó. Johannes Nathan, TIAMSA Chair, and many TIAMSA members were also present at this very well attended event. Find more information and watch the conversation here. The TIAMSA Modern-Art / TIAMSA New York groups organized a private tour with Megan Fontanella (Curator, Collections and Provenance, Solomon R. Guggenheim Museum) of her exhibition “Visionaries: Creating a Modern Guggenheim” at the Solomon R. Guggenheim Museum (1071 5th Ave, New York, NY 10128). It was a great success and the two groups are currently planning a follow-up in the fall. If you are interested in joining one of the New York groups, please contact either Christel Force (Christel.Force@metmuseum.org) or Natasha Degen (natasha_degen@fitnyc.edu). About 50 TIAMSA members and friends attended our reception at Christie’s Education, Rockefeller Center, 1230 Avenue of the Americas, 20th Floor on 16 February. 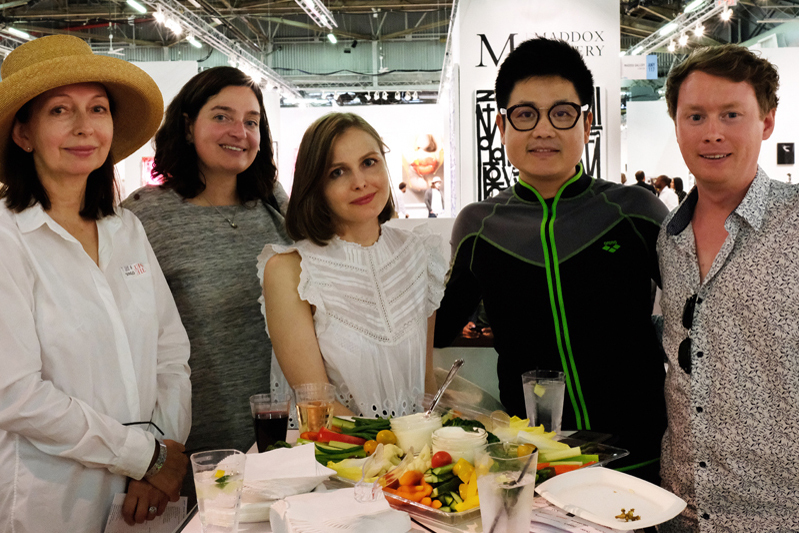 Thanks to our host and TIAMSA member Véronique Chagnon-Burke (Director, Christie’s Education NY) and her great team, we enjoyed networking and meeting new members in a highly convivial atmosphere. Notable guests included Thomas Gaehtgens (Director, Getty Research Institute), Inge Reist (Director of the Frick’s Center for the History of Collecting), Thomas Kirchner (Director, Centre allemand d’histoire de l’art in Paris), and colleagues from institutions such as the Met, MoMA, the Fashion Institute of Technology, Jay College of Criminal Justice, Duke University, and others. Follow this link for some photos.